Vanguard's GH-100 Pistol-Grip Ballhead combines impressive ergonomic control with a precise, smooth ballhead. 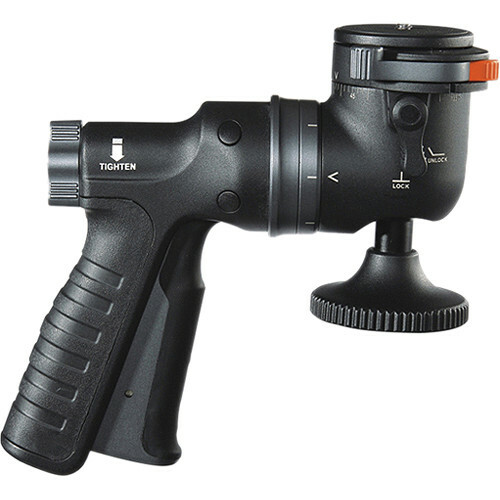 The lightweight pistol grip allows you to lock, unlock, and reposition your gear comfortably with one hand, leaving your other hand free to make lens adjustments. It has a separate panning lock and a single bubble level. The 360° panning mechanism has 72 built-in click stops for precise positioning for panoramic photos, and side-to-side tilt of -32° to +90° and -8° to +90° of back to front tilt give you a wide range of camera movement. An efficient friction control system allows you to modify the level of friction on the ball to accommodate changing equipment weight, such as switching to heavier lenses, while the anodized center ball facilitates extremely fluid movement without sacrificing precise control. A dual-locking quick shoe mechanism prevents accidental release to protect your equipment. The QS-65GH quick release plate is included. Box Dimensions (LxWxH) 9.4 x 8.8 x 4.0"
GH-100 Pistol-Grip Ballhead is rated 4.3 out of 5 by 66. Rated 4 out of 5 by David from Good control and flexibility I decided to give this pistol-grip ballhead a try since it was only $. I have an old Manfrotto vertical pistol grip that is starting to fall apart (from my dropping it a couple times), so this looked like a good replacement. I was impressed by the amount of flexibility and control this pistol grip has. It not only lets you vary the tightness of the ballhead, but also lets you change the angle of the grip itself. My only minor complaint is that the spring in the grip itself cannot be controlled and takes a bit of strength from the pinky and ring fingers to squeeze.It's great for macro shooting, especially with a focusing rail. Rated 4 out of 5 by Saltcityphotography.com from Nice, but not perfect I bought this ballhead when the pan head on my Vanguard Trecker II tri-pod failed. It threaded right on and fit securely. At first, it was a bit bulky and stiff, but after figuring out the function and breaking it in a bit, it is smooth now. My only complaint is the vertical movement limitation. This ballhead will not move very high in a vertical direction unless you mount the camera on it backwards (goofy but it works). The pan function is nice and I enjoy the function of the pistol grip over the ballheads that do not have them. This unit is worth the money and dealing with the vertical function (or lack of) in my opinion. Rated 2 out of 5 by Bigdog from long term update from my 2012 purchase & review Just an update on my GH-100 ballhead. After 4 years of use I have come to the conclusion that the tension adjustment is the big Achilles heel on this tripod head. As the head wears, It becomes nearly impossible to adjust the tension enough to hold my 6lb setup (half the heads rated load capacity) unless I'm shooting dead level. Problem is that the tension adjustment is limited in it's travel. Even when it was new, I had to have it set at maximum to hold tight. While the idea behind this design is wonderful and it is a pleasure to use. The fact that this head becomes nearly useless at only half it's load rating is disappointing to say the least. Therefore I'm down grading my former 4 star rating to two. I wouldn't recommend this head until Vanguard improves the tension adjustment so that it can be adjusted for wear. Rated 4 out of 5 by bigdog from Almost perfect This ball head has been great. Takes a little time and some fiddeling around to figure out how everything works. If folks would do that one thing. they wouldn't ding it for lack of vert capability. Which it can do. The one thing I don't like is the tension adjuster does not have a positive lock. More than once. I have set up my tripod and this head. And upon mounting the camera I have had it fall over because the tension adjuster had been nudged to the loose setting during transport. I now always double check this. Rated 5 out of 5 by FallingLeavesPhotography from Solid tripod head There is a definite learning curve to this tripod head, and right out of the box it comes fairly stiff. It does however deliver a very unique, and ergonomic experience for tripod use. It's not one that I would suggest for panning video, because you won't get a consistent pan result as far as I'm concerned. For photography however it really is a great head to use. Again there is a learning curve of <30 minutes involved, but anyone who is going to be using this even semi-professionally will be used to learning their equipment so it's a non-issue. Overall it's a great tripod head for the price and I'd recommend it for photographers. Rated 3 out of 5 by Eye4Class from Good for light/medium weight. Functions very well with a pro-level camera and low/medium weight lens & other attachments (flash etc). However, I found that the screw-in connector plate (at the bottom of the camera) did not secure the weight of a heavier lens (Canon 70-200 f2.8 L)& same accessories in portait orientation. Even after tightening the screw by a fair amount (so as not to break the ring), I still needed to keep tightening every so often. Rated 1 out of 5 by Anonymous from Great design except... After about 6 months, the camera started to wobble. I thought it was loose, but it turns out that where the quick connect sits starts to wear a bit and there is no fix other than to hot glue a thin slice of suede in there. Once the wobble starts, it will never lock in tight. The tilt can be corrected by turning the handle 90 or 180 degrees which takes a few tries to get used to. Other than the wobble, a major concern to everyone that has tried mine, it's a great tripod head, especially for panoramas, 5 degree clicks at a time for a full 360! Rated 5 out of 5 by Bill_in_WA from Fantastic! I use a Canon 5D MKII and 7D for scenic, water, and wildlife. Aside from the normal shorter lenses I also use a 100/400, 70/200 f2.8, and 70/300L. I have used a competitors pistol grip in the past but found that it lacked the ability to lock into different planes. With the GH-100 I am now able to take some nice video pans as well as follow wildlife in all axis. The usit is very stable with the heav1er telephotos mounted. Much faster to use than the conventional 2 axis ball. Lightweight and compact. A great unit! Can I replace the plate with an ARCA plate? Note also that Vanguard has a slightly different product, the ALTA GH-100, also available at B&amp;H (# VAALTAGH300T), which comes with an Arca clamp. That model, unfortunately, features a grip that is so similar to that of a handgun that i wouldn't want to take it through an airport. Again, almost useful. So close. Does this come with the quick release plate? Does this operate the Shutter also ? I have a fotopro C5i tripod. Will this fit on it? As long as your tripod has a standard 1/4-20 or 3/8-16 thread for mounting a head, the GH-100 Pistol-Grip Ballhead would be compatible with your tripod. Can you use this to shoot moon or stars at night? By itself, the short answer is no. But if you combine it with a suitable tripod that offers a load capacity that exceeds that of the weight of your camera setup and its accessories, not forgetting that your ball head also needs to be similarly rated, yes you can then use it to shoot the skies. Results should be much better if you pair your camera with a remote shutter release or simply use timer countdown function to eliminate camera shake that can potentially blur your shots. Hope this answers your query. Would this work on a monopod? Sure would. As long as you have a monopoly with the comparable 1/8 inch thread.